This ground level 1Br/1Bath condo is over-looking Glory Hole Park located in the heart of Aspen. The unit offers privacy and views of the park. Open the stained glass front door to the serenity of the park and pond. This condo features a fully equipped kitchen with granite countertops and a marble bathroom with a jetted tub. This unit features dining for four, convenient breakfast bar, washer/dryer and private patio. The fireplace is non-working. 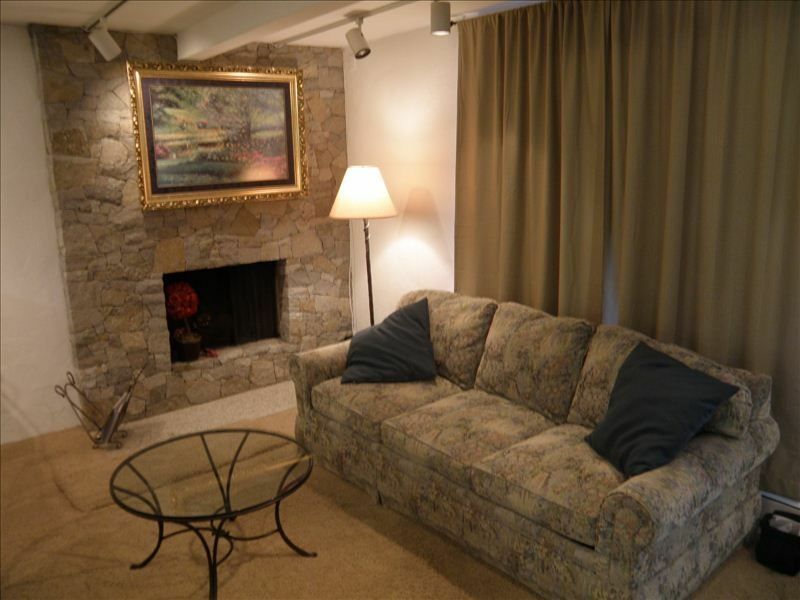 The condo is a two minute walk to Aspen Mountain and the Gondola. The City Market grocery store is block away. Walk through charming Glory Hole Park to any of Aspen’s downtown restaurants and shops. The free shuttle to Snowmass, Highlands and Buttermilk is three (3) blocks away. Skiing, hiking and most other activities are practically in your front yard! Sit on the front porch and have coffee or lunch while enjoying the park or your view of Aspen Mountain. This is a full condo for less than the price of a hotel room. Location near the base of Aspen Mountain and the city center, facing the very desirable area of Glory Hole Park. Marble counter top and floor, jetted tub. Large bathroom for a one bedroom condo. Granite kitchen top, fully equipped. Dining table seats four plus there are three bar stools. Well equipped Granite Countertop Kitchen with Microwave, Washer and Dryer, Marble Bathroom with Jetted Tub. No Pets and no smoking of any kind. Parking on Premises. Housekeeping required at checkout and more often depending on length of stay. My wife and I had a wonderful stay in this delightful condo. It is located in the city core a few minutes walk to the ski lifts, all the restaurants and grocery store. You definitely do not need a car to get around Aspen from here. The building is in a quiet area nestled among trees and the unit faces a small park. The owner is very easy to work with. The bed is super comfortable and if you want to cook, the kitchen is fully equipped.The bathroom is tastefully done in marble and tile and has a jetted tub. We are disappointed it is not available for our stay this year and highly recommend this unit. Great condo, walk to all! My husband and I truly enjoyed our stay in your condo. What a perfect location to get to the lifts, ski all day, then go out again at night. Right on the edge of town, we could walk everywhere easily. Wish I could say that the kitchen was wonderful to cook in, but we went out! I would recommend this unit to anyone. Think Snow! World Class Skiing at your choice of four ski areas, Shopping, Fine Dining, and Nightlife that make Aspen the envy of the rest of the world.